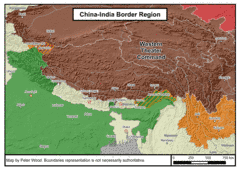 In July, China reportedly crossed the Line of Actual Control (LAC), the de facto border between India and China, at Barahoti in India’s northern state of Uttarakhand on at least two separate occasions. In addition to Chinese aircraft carrying out reconnaissance sorties in the area, 20–25 soldiers of the People’s Liberation Army (PLA) reportedly crossed into the demilitarized zone at Barahoti (Cankaoxiaoxi, August 2; Times of India, July 31). These incidents again highlighted India’s poor overland connectivity near the 3,488-km-long disputed border with China. The border post at Barahoti, for instance, is dependent on a single road that stops 20 km short of the LAC. Beyond that road, human porters and pack animals must carry supplies to the border post (India Strategic, September 2013). While both countries are engaged in extensive road and rail building projects on their respective sides. Chinese progress, however, has significantly outpaced India’s. Indian Roads have been allowed to deteriorate and rail connections are non-existent and there is mounting concern in India that poor overland links to the LAC could prove costly in the event of a military confrontation with China. In a bid to bridge this gap, India is strengthening force levels and military infrastructure along the LAC. The number of troops at border posts is growing; posts that were once manned by platoons now host companies (The Telegraph, July 18). India is raising a Special Mountain Strike Corps of 80,000 soldiers capable of launching offensive action in the Tibet Autonomous Region (TAR) (Indian Express, February 8). Along the western portion of the LAC armored regiments of T-72 tanks are augmenting this capability. Four regiments of the BrahMos short-range supersonic missile in Arunachal Pradesh will add to India’s conventional military deterrence in the eastern sector (The Hindu, July 19; Indian Express, August 3). India’s air power and infrastructure has grown too. Sukhoi-30 MKI combat aircraft are flying from new bases in eastern and northeastern India and at least half-a-dozen squadrons of the indigenous Akash surface-to-air missile guard India’s airspace in the eastern Himalayas. Old Advanced Landing Grounds (ALGs) are being refurbished and new ALGs and air stations built closer to the LAC (Times of India, August 22, 2014; The Pioneer, August 20). India’s humiliating defeat in the 1962 war with China left a deep impact on its national psyche that is reflected in its defense and nuclear policies. In the aftermath of the war, India adopted a defensive strategic mindset toward China, most visible in its decades-long hesitation to build roads near the LAC. Indian policy makers feared that new roads near the LAC would facilitate the rapid advance of Chinese troops into the Indian heartland in the event of another Sino-Indian war. Consequently, up to the mid-2000s, India consciously let existing roads near its border with China fall into disuse and refrained from constructing new ones. In 2006 India’s Cabinet Committee on Security, its topmost policy-making body on national security, finally green-lit construction of 73 strategic roads near the LAC (The Hindu, June 30, 2006). While military considerations drove the decision to upgrade border infrastructure, improving facilities and economic opportunities for communities living in remote border areas also played a role in the policy (India Strategic, September 2013). However, plans to improve this infrastructure are significantly behind schedule. According to the 19th report of its Parliamentary Select Committee for Defence, of the 73 strategic India-China Border Roads that the government approved for construction in 2006–07 and planned to complete by 2012, just 21 roads have been built so far. Work on two roads is yet to begin (Indian Express, May 6). Plans for new railway lines are even further behind. In 2010, India identified 28 strategic railway lines in areas bordering China, Pakistan and Nepal, prioritizing 14 of them as strategically important for national security. Construction has not yet begun on any of them (Indian Express, July 6). In recent decades, China’s roads and railway lines in Tibet have expanded toward its borders with India, Nepal and Bhutan. The Golmud-Lhasa railway line, which was inaugurated in 2006 and linked to Xigaze in 2014, is being extended to Gyirong, a land port near the border with Nepal, and to Yadong, a trading center that is a few kilometers from Nathu La, a vital mountain pass linking Tibet with the Indian border state of Sikkim. There are also plans to extend this railway line to Nyingchi, a trading center and garrison town just north of Arunachal Pradesh, and onward to Dali in Yunnan province. Running parallel and close to the McMahon Line, the Lhasa-Nyingchi-Dali rail would enable the PLA’s 14 Group Army headquartered in Kunming, with its divisions at Dali, Kaiyuan and Kunming to be deployed rapidly to along the McMahon Line (Institute for Defence Studies and Analyses, NDTV, August 15, 2014 and China Daily, August 5). This extension of its Himalayan roads and railway lines up to its borders with South Asia would not only facilitate China’s mobilization of troops in the event of military confrontation with India but also, this is enhancing Beijing’s influence in these countries. Roads linking China with Nepal, for instance, are providing the latter with an alternative trade option to its current enormous dependence on trade with and through India (China Brief, November 16, 2015). It has prompted Nepal to turn to China to meet a part of its fuel requirements. Such trade would expand further if the plan to extend the Xigaze-Gyirong rail to the Nepali capital, Kathmandu, materializes (Global Times, May 24). China has even proposed extension of Xigaze-Gyirong-Kathmandu rail line up to Nepal’s border with the Indian state of Bihar. Beijing can be expected to pursue this project, as it is trade with the large Indian market that would make trans-Himalayan trade economically profitable for China (Business Standard, May 24). China’s improved infrastructure in the TAR and near the LAC has added immensely to its military capacity. China’s ability to rapidly deploy forces has increased “tremendously with the infrastructure built up over the last decade.” All-weather roads and rail infrastructure in addition to a number of airstrips that have come near the LAC give it an “edge in deploying forces.” With the improved infrastructure, China can now deploy up to 32 divisions (previously only 22), and, importantly do so year-round. Additionally, China’s creation of logistic and fuel depots near border regions suggest that China is attempting to improve its ability to not just rapidly deploy forces but also to sustain them for a significant period of time. Clearly, China’s infrastructure development gives it a huge advantage over India at the LAC. Daulat Beg Oldie, India’s most significant outpost adjoining Aksai Chin, is yet to be linked by road. Tawang, an important bone of contention in the Sino-Indian border dispute, has just a single, narrow, pot-holed road linking the town to Bum La, the last border post on the Indian side of the McMahon Line. Conditions on the Tawang-Bum La Road are so poor that it takes three hours to cover the 30 km distance. Even trucks and other heavy vehicles cannot ply this road. While the condition of this road hasn’t improved since 1962, the Chinese have constructed a four-lane highway running within 4 km of the McMahon Line. It takes the Chinese a mere 45 minutes to reach the Bum La Post from Sonajung town, which lies 37 km from the McMahon Line on the Chinese side (Arunachal Times, June 6, 2012 and Outlook, October 22, 2012). The absence of roads to the LAC means that supplies for outposts in forward positions have to be airlifted. This is the case with Daulat Beg Oldie, for instance, where supplies must be airlifted, leaving personnel and operations here extremely vulnerable to poor weather conditions and enemy action (India Strategic, September 2013). The absence of roads and rails would be felt especially in a time of crisis. India’s mobilization of forces to forward posts would be severely hampered as it will have to depend on aircraft to augment force levels. Importantly, the full potential of augmenting troop levels, raising strike corps and improving air strike and defense capabilities are likely to be tapped only if these are supported by robust road and rail links. In the latter’s absence, “the cruel Himalayan terrain reduces even the largest divisions to isolated groups of soldiers sitting on widely separated hilltops” (Business Standard, April 25, 2013). With a strong road and rail network, India could reduce force levels in the forward areas and station them instead at lower altitudes, with better weather conditions. It could rush troops to the borders when needed; trucks and trains would enable it to move large numbers of soldiers at short notice. This makes it imperative for India to focus its attention on improving overland links to the LAC. The plans for strategic roads and railways could make a positive difference. Construction of the Tawang-Vijaynagar highway and the Guwahati-Tawang Road via Tashigang in Bhutan could reduce India’s current vulnerabilities along the McMahon Line. The latter, for instance, would not only reduce dependence on the current Tawang-Bum La route but also allow for bypassing the Se La pass that is prone to avalanches and landslides. It would also cut travel time between Guwahati and Tawang by six hours (Indian Express, October 16, 2014 and Arunachal Times, April 30). Besides, the Indian government plans to construct three strategic railway lines—the Missamari-Tawang railway line, Murkongselek-Pasighat-Tezu-Parasuramkund-Rupai line and the North Lakhimpur-Along-Silapathar line—in the Northeast. Of these, the Missamari-Tawang railway line would strengthen logistic support to the strategic Bum La post. Missamari is home to an infantry division, air force station, oil depots etc. Troops stationed at the base here could be transported in large numbers via train to Tawang within hours (Economic Times, May 10, 2015). The Himalayan region places tough logistic burdens on militaries operating there, making improvement of roads and rails a priority for China and India. While framing their infrastructure projects in economic terms, China’s progress has real strategic implications. Though the Indian government has often promised to prioritize its own building programs, these have yet to pan out. Dr. Sudha Ramachandran is an independent researcher and journalist based in Bengaluru, India. She has written extensively on South Asian peace and conflict, political and security issues for The Diplomat, Asia Times and Geopolitics. The LAC is divided into three sectors: the “western sector” between Ladakh and the Aksai Chin, the “central sector” between Uttarakhand and Tibet, and the “eastern sector” that divides Sikkim and Arunachal Pradesh from Tibet. India lays claim to 38,000 sq km of territory in Aksai Chin that is under Chinese control and China claims 90,000 sq km of land that roughly approximates Arunachal Pradesh. The central sector in which Barahoti falls is the least contentious sector. A Squadron consists of two batteries, each composed of four launchers. Rajeswari Pillai Rajagopalan and Rahul Prakash, “Sino-Indian Border Infrastructure: An Update,” ORF Occasional Paper no. 42, New Delhi: Observer Research Foundation, May 2013, pp. 20–21. Author’s Interview, Indian Ministry of Home Affairs official, New Delhi, August 24, 2016. John W Garver, Protracted Contest: Sino-Indian Rivalry in the Twentieth Century, New Delhi, Oxford University Press, 2001, pp. 80–88. Author’s Interview, Government of Sikkim official, Gangtok, December 26, 2008. Author’s Interview, Rajeswari Pillai Rajagopalan, Senior Fellow at the Observer Research Foundation in New Delhi, August 23, 2016. Rajeswari Pillai Rajagopalan and Rahul Prakash, “Sino-Indian Border Infrastructure: An Update,” ORF Occasional Paper no. 42, New Delhi: Observer Research Foundation, May 2013, pp. 6–10.